Changing the Cultural Narrative: Is the Church hurting or helping? An event for church leaders, inquisitive followers of Jesus, and anyone who wants to help make the world different, better, more reflective of God’s nature of compassion and love. 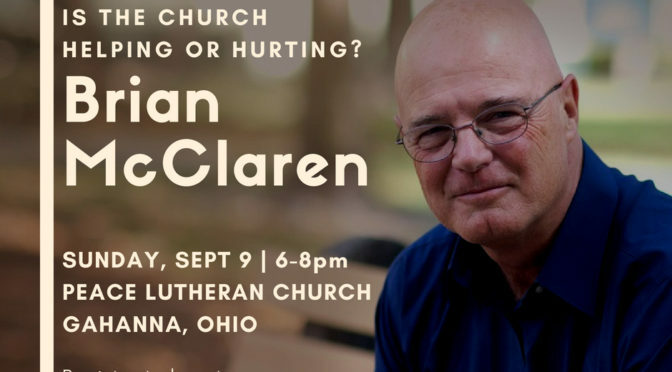 Brian D. McLaren is an author, speaker, activist, and public theologian. A former college English teacher and pastor, he is a passionate advocate for “a new kind of Christianity”-Just, generous, and working with people of all faiths for the common good. McLaren is the author of numerous books including A New Kind of Christian, The Great Spiritual Migration: How the World’s Largest Religion is Seeking a Better Way to Be Christian, Naked Spirituality: A Life with God in 12 Simple Words, and Everything Must Change. His book, Everything Must Change, challenges the primary cultural narratives around our culture of violence, our economic system, and our system of equity, offering both an insightful critique of those narratives and a hopeful way for us to move forward together. These are the themes he will explore on Sunday, September 9 from 6:00-8:00 at Peace Lutheran Church, Gahanna, Ohio. Following his presentation there will also be time for Q and A from those gathered. The cost for the event is $10. REGISTER NOW! We look forward to seeing you, being with you, and then working together to Change the Cultural Narrative .